Men who have BPH with symptoms usually need some form of treatment at some time. The following section describes the types of treatment that are most commonly used for BPH. Over the years, researchers have tried to find a way to shrink or at least stop the growth of the prostate without using surgery. The FDA has approved several medications to relieve common symptoms associated with an enlarged prostate. Our board-certified urologists can work with you to prescribe the right medication for your symptoms. Because drug treatment is not effective in all cases, researchers in recent years have developed a number of procedures that relieve BPH symptoms but are less invasive than conventional surgery. These include: UROLIFT treatment – is a minimally invasive approach to treating BPH that lifts and holds the enlarged prostate tissue out of the way so it no longer blocks the urethra. 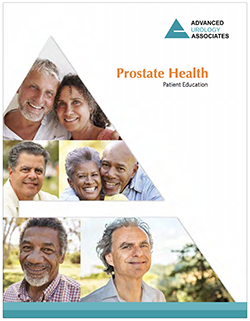 There is no cutting, heating or removal of prostate tissue. Learn More About UROLIFT. Early, immediate relief of symptoms and fast return to normal activity. Patients usually go back to work within two to three days and can resume their physical exercise within two weeks. Next-day catheter removal in most of the cases with less than 24 hours hospital stay. Fewer potential complications. The holmium laser technology offers a low-depth of penetration of less than half of 1 mm, which causes less damage to the underlying healthy tissue and lowers the risk for excessive bleeding. Advanced Urology Associates has years of experience with BPH and can help you decide what treatment is best for you. There are many options to choose from and we’re here to help find the right one. Request an appointment with us today at any one of our locations. Simply click the link below or call us at 815.409.4930. Advanced Urology provides BPH treatments for patients in patients from Aurora, Bolingbrook, Bourbonnais, Chicago, Crest Hill, Elk Grove Village, Elmhurst, Frankfort, Homer Glen, Joliet, Kankakee, Lombard, Lockport, New Lenox, Mokena, Morris, Naperville, Orland Park, Park Ridge, Peotone, Plainfield, Tinley Park and Woodridge.